You can hear the sounds when you walk down Hollywood Boulevard. Some that your recognize, some that you’ve never even heard before. Not far from where Hollywood meets Vine, these sounds emanate from the gallery LACE, or Los Angeles Contemporary Exhibitions. They’re a gentle, quiet array of noises, some seemingly melodic, but many with the feel of modified field recordings. I was wandering the star-lined streets a few weeks ago with some guests when I was struck by these noises, delicate but somehow insistent. I let my travel mates wander further down the block, in search of funny wigs and plastic toys, and ducked briefly into the gallery. 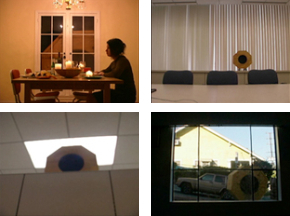 In the video, the octagon is filmed between interior and out door spaces. I was thinking of the sound and the smoke being related, filling the room and acknowledging the blurred distinction that often occurs between these spaces. Aaron Drake composed the score for Percolate that then Stephen Chiu and myself integrated it back into the original soundtrack. We then passed that soundtrack back to Aaron which he then remixed for the out door sound installation. It was important in the video that the sound of the outdoors and interior environments spill onto each other, building together to complete a full song at the end of the piece. Essentially my concept was how these segments combine to create something whole or full. The video inside the gallery and audio from the outdoor installation subtly over lap each other creating traces and echoes of one another enforcing the concept of the video. At first glance I thought of each size of octagon as its own character – that they were related by genus or family but that they had their own autonomy (e.g. that they were blood relations but individual personalities) and that each of these octagons were specific to location (locations being interior and exterior – even so specific as office/unnatural and outdoor/natural). After working with the materials and seeing the video a number of times however, I realized that the octagon was a singularity which expressed itself differently in the two (+) environments – an echo of itself represented as either an increase or decrease in size. I thought the idea could be reinforced in the two installations as well. Ultimately, the two compositions are the same (video score vs. sound installation) but they express themselves differently in that some of the compositional relationships are more exposed (i.e. volumes of environmental sounds, natural or unnatural) outside – an increase in the composition’s scope – like the increase of the octagon. I also sonically reinforced the difference in environments that was represented in the video by subdividing the composition differently than the video score. Basically there are three parts to the installation’s composition. Part 1, which is dedicated to the sounds of the office/unnatural, then part 2 with the sounds of outdoor/nature and finally their combination where a dialog is built between the natural and unnatural sounds. The music follows this same transition where musical parts come and go and then coalesce in the final sequence. The ultimate scene is a sort of convergence of environments for me – the inside and outside – and so it made sense that the composition fulfills itself there. LACE’s storefront provided a perfect place to have this sort of convergence since it has its own sound identity. I think the composition adds a disjunction to the blvd’s sound world – something similar to that of the video – an echo of the concept. I think its great to hear this soft guitar lullaby, sounds of the outside (animals, wind) and office machines while walking down Hollywood blvd. More info at the LACE gallery’s website, artleak.org. More info on Schwartz at her website, mindyroseschwartz.com. The overlooker exhibit runs through April 26.